Land/Cruise only price does not include arrival/departure transfers. Mar 14, 25 & 28 departures end in Passau instead of Regensburg. 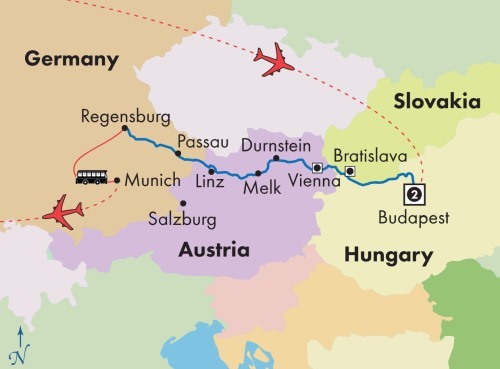 Budapest to Regensburg: Passengers returning from Munich on Day 11 should select flights that depart no earlier than 11:00 am. The Munich airport is approximately a 1.5 hour drive from the Regensburg port. Regensburg to Budapest: Passengers arriving to Munich on Day 2 should select flights that arrive no later than 2:00 pm. Transfers to Regensburg will depart at approximately 9:00 am, 11:00 am, 1:00 pm and 3:00 pm. The port is approximately a 1.5 hour drive from the Munich airport. Embarkation will begin at 2:00 pm. Budapest to Passau: Passengers arriving to Budapest on Day 2 should select flights that arrive no later than 3:00 pm. Passengers returning from Munich on Day 9 should select flights that depart no earlier than 11:00 am. The Munich airport is approximately a 2 hour drive from the Passau port. Passau to Budapest: Passengers arriving to Munich on Day 2 should select flights that arrive no later than 2:00 pm. Transfers to Passau will depart at approximately 9:00 am, 11:00 am, 1:00 pm and 3:00 pm. The port is approximately a 2 hour drive from the Munich airport. Embarkation will begin at 4:00 pm. Due to physical constraints and space limitations, wheelchairs and walkers are not allowed on motor coaches and/or river cruises. There are no elevators or chair lifts on board. While sailing with Monarch Cruises, passengers are subject to the cruise's Terms & Conditions.